The Paradigm Esprit v.3 loudspeakers -- and an accompanying home-theater speaker array -- arrived while I was between houses and living in a small apartment. When the system arrived, I put the Esprit v.3s in place so they could get a little break-in time before I began serious listening. As I only had a couple of weeks before moving into the new house, I left the remainder of the speakers boxed until I could assemble the entire package in my new space. The fact that the Esprit v.3s are compact and front-ported meant that they could be placed close to walls, and this made the transition to a small space much less painful than I had anticipated. Their elegant good looks made them a welcome addition in the small room. The primary speaker under review here is the Esprit v.3, but Paradigm was kind enough to send along a CC-270 v.3 center-channel ($279), ADP-170 v.3 surrounds ($449), and a PDR-12 subwoofer ($419). The Esprit v.3s, according to Paradigm, can be used successfully in a simple stereo system or a full-fledged home theater. I tested them in both. The Paradigm Esprit v.3 is a smallish, two-way floorstanding speaker approximately 34"H x 7.75"W x 10.75"D. The conventionally shaped box houses a 1" ceramic/metal composite (CMC) dome tweeter mounted above a single 6.5" metallescent cone woofer with a large front-firing port beneath the woofer. Connections are made via a single pair of plastic-nut binding posts near the base of the speaker. Paradigm rates the Esprit v.3 as having 88dB in-room sensitivity, 8-ohm impedance, and bass extension down to 35Hz. The finish is an attractive, understated cherry vinyl laminate that actually goes quite nicely with the cherry finish of most of the furniture in my room. A black, cloth grille covers about three-quarters of the face of the speaker. Paradigm designs all of their speakers to be used with the grilles on and thats how I spent most of my time with them. Adjustable spikes are included for coupling the speakers to the floor. Rapping the sides of the speakers produced the expected echo from inside the box in return, but my reference Silverline Sonatinas quite frankly dont fare a whole lot better on this test. Given this description, there is nothing obviously surprising about the Esprit v.3s except for one important point: This is a very substantial floorstanding speaker that goes for all of $399 per pair! Whats more, my wife was immediately impressed by their looks, not to mention their sound, which is always a good sign where new gear coming into the house is concerned. I teamed up the Paradigm Esprit v.3s with an Onkyo TX-S696 surround receiver and a Toshiba SD-1800 DVD player. I also tried them with the Linn Classik Movie System toward the end of the review period. Once I had the Esprit v.3s properly set up and broken in, I sat down for some serious listening sessions. The apartment I was in, it turns out, was something of an acoustical nightmare. When I initially set up the Paradigms there, I noted a lack of bass on most material, but didnt think much of it as I had noted this as a problem with other speakers in the same space. The room in my new house, on the other hand, is a pretty well-balanced acoustical space. Once the Esprit v.3s settled into the new system, the bass response improved dramatically. Thats not to say the Esprit v.3s present the last word in bass response, but they are impressive with most musical recordings. As a matter of fact, by the end of the review period it became apparent that they were holding their own with most video material as well. The overall sound of the Esprit v.3s paired with the Onkyo receiver is a little to the warm side of neutral at low volume levels, but is very nicely balanced at moderate and high volume levels. Imaging is precise, even with a six-foot-wide entertainment center stuffed between the speakers. The soundstage was always precisely rendered. One thing that struck me was that I never found the Esprit v.3s to be fatiguing, and this is highly unusual in even the best budget speakers Ive listened to. When I replaced the Onkyo with the Linn Classik, the bass got a little tighter and the highs became a little more open still, proving that the Paradigms have enough resolution to point out the differences in associated equipment. It was Trey Anastasios self-titled solo album [Elektra 62749] that helped me realize that the bass response was more than just fine. Comparatively, its right on track with the now-discontinued Energy C-2 speakers, but comes with more authority. On "Flock of Words" the snare drum was perfectly placed just to the right of center, while the speakers never drew attention to themselves. The Esprit v.3s presented the soundstage across the entire front of the room, well beyond the edges of speakers. The piano at the opening of "Ether Sunday" sounds entirely convincing and the bass backbeat is tight and clean. The recording is light and lively and the Esprit v.3s conveyed the spirit and soul of the music completely. Jane Monheits Come Dream With Me [N-Coded 4219] is a recording that I frequently feel is irritatingly bright on some speakers. This was never the case with the Esprit v.3s and yet I did not feel as though I was losing high-frequency information. Monheits voice came through crystal clear and natural sounding on "Over the Rainbow." There was always a nice sense of air and openness. On "Im Through With Love" I could almost close my eyes and believe she was in the room with me; her voice hung in the air just in front and to the left of dead center of the speakers. The Paradigm Esprit v.3s really showed their stuff on The Best of the Nylons [BMG 10308]. This recording is strictly vocal and percussion and was recorded with great attention to reproducing the original soundstage. In the best systems, the soundstage expands to cover the entire front of the room and the speakers simply disappear, and that was surely the case with the Esprit v.3s. As matter of fact, they did as well in this respect as the best speakers I've had in the house. This is pretty impressive for a $399 pair of speakers! Since theres little to nothing competing with the wide-ranging vocals on this album, this is also a good recording to point out midrange colorations. Im happy to say there was nothing obvious to report. OK, there's probably a lot more I could tell you about how this recording sounded on the Esprit v.3s, but I kept listening to the music and stopped listening critically to the speakers -- on three separate occasions! 'Nuf said. Though I was primarily interested in two-channel audio performance, as I mentioned, Paradigm did ship a full home-theater system and I spent a lot of time using it. The CC-270 v.3 center-channel is a bit large as far as center-channels go, especially in this price range, and this pays dividends when it comes to dynamics and power handling. Some might think the surrounds are a bit pricey considering the cost of the Esprit v.3s, but the "optimized reverberant" design paid huge dividends in reduced localization of the rear speakers in my relatively confined space. The PDR-12 subwoofer is being tested independently so look for a full review soon. While the Paradigm system has been in the house, weve probably watched at least two-dozen movies of all varieties on it. The results were fairly astonishing, to say the least, as the soundfield is coherent, enveloping, and detailed. When you consider the total price, its simply mind-boggling how good the Paradigm setup sounds. I think its safe to conclude the Esprit v.3s will fit in a home theater quite nicely. The closest speaker I could think of to compare the Paradigm Esprit v.3 to was the Paradigm Atom ($189/pair). While Paradigm's bookshelf speakers are significantly less expensive, they share some basic technology and design philosophies, so the comparison is useful to show what the extra dough buys you. The Esprit v.3s up the ante with higher-tech drivers and an advanced crossover design. This results in a speaker with a cleaner and more open top end, particularly at low volume levels, which is one area where the older Atoms may have lacked a little life. While I wouldn't call the Esprit v.3s lively at low volumes, I didn't feel I was missing anything either. The midrange was a little cleaner than with the Atoms too, which is particularly surprising in an inexpensive floorstander where the realities of cost control dictate that the cabinet isn't going to be as free of resonance as that of a small bookshelf speaker. Soundstaging and imaging were at least on par with the Atom. As expected, the Esprit v.3 walked all over the Atom where bass response is concerned. It goes deeper, plays louder, and is cleaner sounding than the Atom in every respect. Since the Esprit v.3s do nothing to spoil the midrange, this alone may be enough reason to stretch the wallet a little to buy the Esprit v.3s instead. Not having to fool with stands is just a nice bonus. 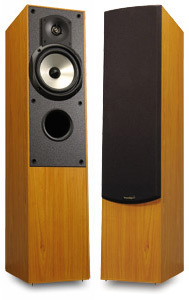 By far the biggest surprise was how the Esprit v.3 compared to the venerable Energy C-2 speakers. The C-2s cost $200 more than the Esprit v.3 when I bought them several years ago and were among the better $600 speakers on the market at the time. Judging by the highly complimentary reviews the C-2 received during its production, I would have expected it to still be somewhat superior to the Esprit v.3, but that turned out not to be the case. The Esprit v.3 has a slightly smoother, if a touch more reserved, top end. The midrange of the Esprit v.3 is at least on par with the C-2, if not a bit cleaner. Bass response seems to be about equal in quality, but the Esprit v.3 goes lower and has a little more weight behind it. Overall, the Esprit v.3 and C-2 are pretty close in sound quality, but in my opinion, the Esprit v.3 has the edge. If you havent figured out that I was absolutely thrilled with the Paradigm Esprit v.3s, then youve missed something along the way. How Paradigm can afford to build a floorstanding speaker of this quality, ship it, provide a warranty, and still allow your local dealer to make a profit for $399 a pair is beyond me. But they do, and they've obviously achieved an admirable balance between cost and performance through innovation, research, and manufacturing efficiencies. So if your speaker budget doesnt extend much past five bills, theres certainly no need to despair. With the Esprit v.3, Paradigm has once again proven that there are great values to be had for very little money.